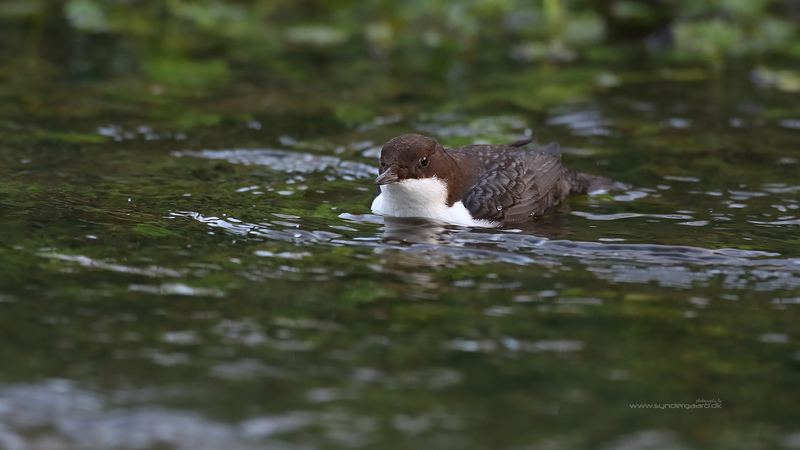 Dippers feed on riverine insects, and spend most of their time in the drink. They prefer fast-flowing stretches and don’t stray much once they have found a good spot. Ever since I began taking pictures of birds it has amused me that there’s almost an inverse proportionality in the relationship between a bird species’ occurrence in a specific region, and the number of images to be found of the same bird on the internet from that same region. Any Martian checking the Internet for birds in Denmark could thus be excused for coming to the conclusion that our most abundant bird is the European Kingfisher, since that is one of the most popular photographic subjects at all among the birds – in spite of being quite uncommon, and unknown by non-birders. It is a similar story with the Dipper (Cinclus cinclus). An uncommon visitor from further North during the winter months, and a very rare breeder, it leads a discrete life and can be difficult to find – but the bird photographers LOVE it. Me too. I have never had any luck with it before, but today I finally found a cooperative specimen. I was covered in mud, but I am pleased with the images I brought home. Click on the images to see them in large size, I hope you enjoy them. Merry Christmas! They are mainly seen around here during the winter, so light is always a concern. This one was cooperative, and I even got some colour into some of the frames. Just back out of the water. This may be my favourite so far.